We review a lot of amazing food and wine here at TheTaste, but it’s not often we get a chance to share it with one of our most passionate food writer’s Niamh Mannion and our Wine Expert Suzi Redmond. So where better for the two worlds to collide than one of Dublin’s finest, Dax Restaurant, where we knew chances of both being impressed were high. Set in the basement of one of Pembroke Street’s stunning period buildings Dax has an unusual appeal of a fine dining setting but with a charm which takes all the fuss and pomp out of these kind of venues. We were fortunate the night we dined there owner Olivier was on hand to offer up some superb wine suggestions and always up for a few surprise elements we chose the six course tasting menu and left the rest up to Head Chef Tomasz Morawski. We started with a stunning bottle of Bourgogne Blanc Domaine Bzikot 2013, a delicious unwooded Chardonnay which paired well with our first three courses. Starting off gently with a refreshing amuse bouche of yogurt and melon gazpacho, followed by Feta Cheese Mousse with Roasted Plum Tomato,Beetroot Puree and Balsamic Dressing which could have easily been mistaken for a dessert due to the impressive presentation. Next up was a Scottish Sea Trout Tartar with a fine kick from the four little dollops of wasabi creme fraiche and avocado puree and topped off with pickled shallot, radish and a sweet soy dressing. 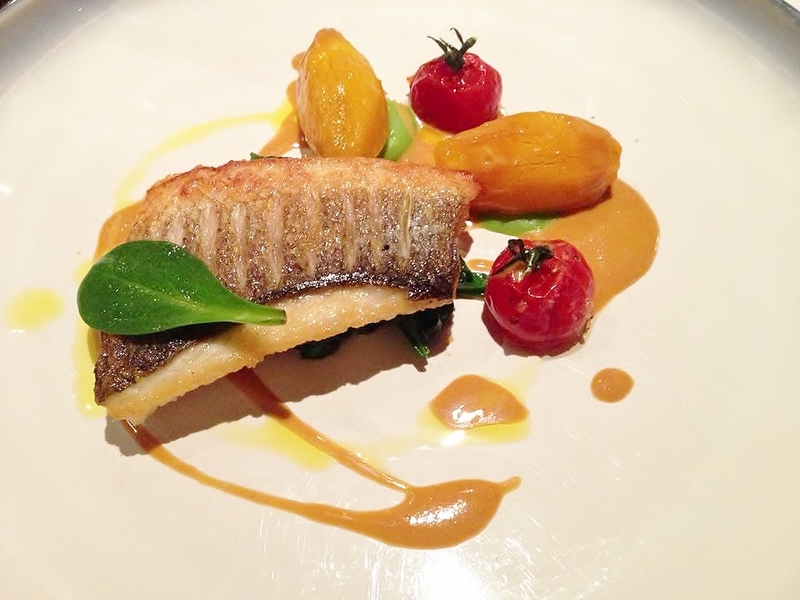 Sea bass when cooked well is always a crowd pleaser and this was no exception, Seared Fillet with truly divine saffron potatoes, sautéed spinach, cherry tomato confit and langoustine bisque with a welcome addition of a delicate little oyster leaf. Now it was the red’s time to shine, again on Olivier’s recommendation and much to Suzi’s approval. A fully bodied Salice de Salentino Reserva Vigna Delle Monache 2011, earthy red with a rich elegance and a superb accompaniment for our Magret of Duck with grilled baby aubergine, roasted baby beets, celeriac puree, and tiny drizzlings of red wine jus. 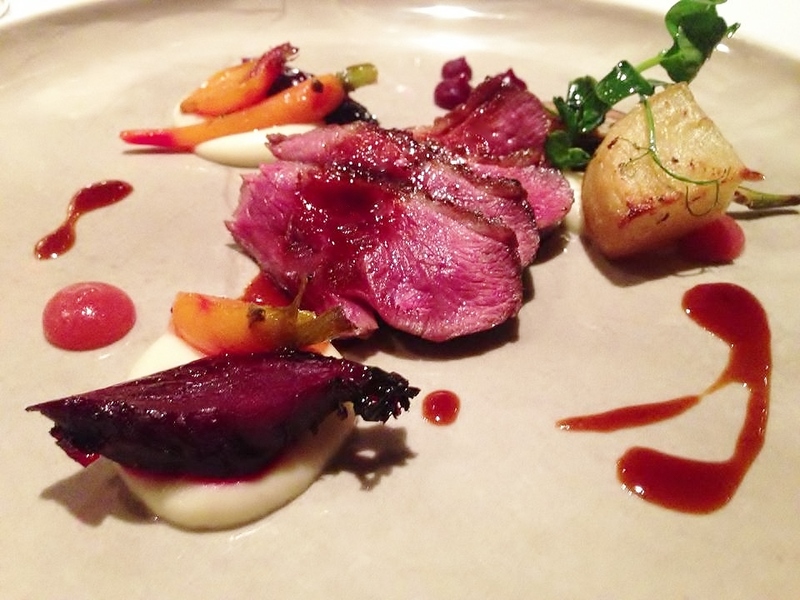 If you love duck we challenge you to find a better tasting dish than this one. If you have read any of Niamh’s many food articles or recipes then you may be aware she has quite the penchant for desserts, chocolate ones in particular! 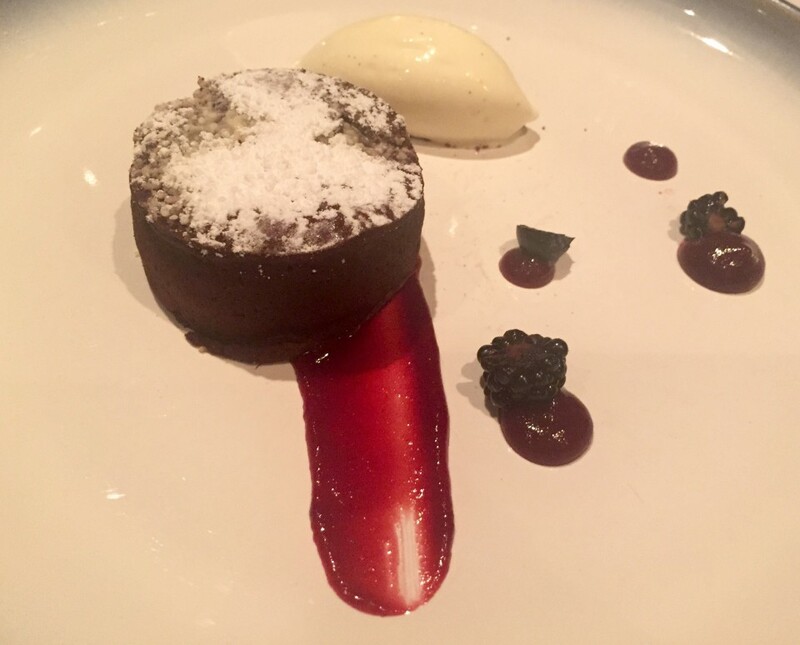 So when our waiter arrived with a sumptuous Dark Chocolate Fondant, which oozed with rich sauce once broken into, some of the other diners may have been a little taken a back by the oohs and ahhs coming from our table. Such is the effect of an amazing dessert. They say a meal without wine, is like a day without sunshine if so Dax will have you feeling like the sun is splitting the skies. If you’re a real food and wine lover this will tick all the boxes and more.